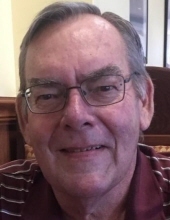 Thomas Allie Eckmann, age 67, of Vernon Hills, Illinois, passed away peacefully in his sleep on March 28th, 2019. Tom was born to the late Chester and Evelyn (Allie) Eckmann, March 25th, 1952, in Chicago, Illinois. Loving father of: Kimberly (Joshua) Turner, Katharine Eckmann, and Tim Eckmann (Kim Burton); cherished Grandpa of: Gwen and Oliver Turner and Derek Eckmann; dear brother to: Jim (JoAnn), Steve (Ann), the late Jeanne, John, and Margaret; and caring Uncle to several nieces, nephews, great nieces, and great nephews. His children remember him as a loving father, doting grandfather, a man who was never afraid to tell you what he thought, but who also had a great sense of humor. He was generous, genuinely concerned about the well-being of others, and a great friend. Tom worked for several companies in their IT/networking departments, but most notable was his time with United Airlines. Some of his favorite pastimes included working around the house, golfing, keeping current on his favorite television shows, staying in touch with family, and enjoying a nice cold beer. An informal gathering to celebrate his life is scheduled for Saturday, April 20th , 2019 at his daughter Katharine’s house in Island Lake. In lieu of flowers the family requests you bring a photo or story highlighting the wonderful life Tom lived. To send flowers or a remembrance gift to the family of Thomas Allie Eckmann, please visit our Tribute Store. "Email Address" would like to share the life celebration of Thomas Allie Eckmann. Click on the "link" to go to share a favorite memory or leave a condolence message for the family.